No classes on April 20. Step in Time and sign up for this fun musical theatre class. Become Mary Poppins and all the characters from Mary Poppins with a special appearance from Mary Poppins Returns. Learn how to sing and move with the music. Discover how to project your voice to the back row and take a proper bow. Songs include: Step in Time, Supercalifragilistic, A Spoonful of Sugar and Can You Imagine That? On the last day of class, April 29th and 30th at 4:45pm, there will be a performance of the songs and scene from the class. You love the book and the musical – now it’s time to play the characters! Become Charlie, Willy Wonka, Violet, Augustus and the rest of the crew in this upbeat scene class. Learn how to interpret your lines, improvise in character and take on the physicality of each character. We know you can’t wait to work on your ROAR so sign up for this musical theatre class! Learn to strengthen your voice, stretch your dancing skills and sing in harmony. Become all your favorite characters from the show while performing I Just Can’t Wait to Be King, Circle of Life, Hakuna Matata and Endless Night. This is the perfect way to prepare your audition songs for our Musical Theatre Camp this summer. Find your theatre voice! Create new characters on the spot, work and play in teams, discover new ways to reveal your personality and get past your shyness. There’s no limit to what you can create in this class. 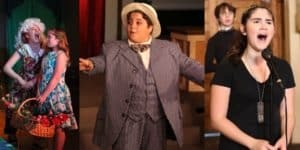 You will play a multitude of theatre games that will develop your acting skills like projecting your voice, cheating out to the audience, trusting your scene partners and thinking in new ways. Making people laugh is one of the great joys in life. Get your funny on while you learn to create comedy on the spot, using simple suggestions and your own top-of-your-head responses. Comedy and the ability to bring humor to a situation serves you in every aspect of your life. We have a long tradition of creating comedy improv at MacGuffin, with our expert comedians performing in This Side Up Comedy Improv Troupe. This class takes your skills to the next level as you explore free form improv, where there is one suggestion and many directions to find your funny. A great time for all! If you like the tv show Whose Line is it Anyway, you can’t miss this class! 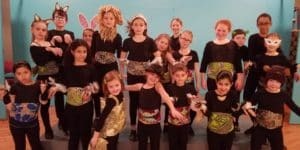 Let your Freak Flag fly in this fun musical theatre class. Learn to strengthen your voice, stretch your dancing skills and sing in harmony. Become Shrek, Donkey, Fiona and the whole fairy tale forest. The class will feature I Know It’s Today, Freak Flag, I Think I Got You Beat and more. This is the perfect way to prepare your audition songs for our Musical Theatre Camp this summer. Follow Your Heart and sign up for this musical comedy class. Learn to strengthen your voice, stretch your dancing skills and sing in harmony. Bring the hilarious characters from Urinetown to life as they struggle to change the rules. The class will feature Follow Your Heart, Run Freedom Run, It’s a Privilege to Pee and more. This is the perfect way to prepare your audition songs for our Musical Theatre Camp this summer. This class is one of the most important ones an actor can take! Learn how to make props in a scene help you to define your character. From coins to canes to letters, you will discover how to use objects to create tension, comedy and heartbreak. There will also be scenes where you will have to eat and drink in character. Don’t miss this opportunity to take your acting to the next level. The actor’s life is comprised mostly of auditioning for roles. The audition process can be scary, thrilling and disappointing. This class is designed to prepare you for every kind of audition experience: theatre, film and commercials. Topics include: putting together a resume, choosing a monologue, acting with others in the audition process, how to find an agent, where auditions are held, and making clear exciting choices on the spot. Learn to make your audition the strongest it can be. Tuition: $125 per 5-week class. Theatre classes are 1 hour in length unless otherwise indicated. Tuition will NOT be refundable after the 1st week of theatre classes. Classes are held at the Adrienne 2030 Sansom Street, 2nd floor, Philadelphia, PA 19103.